Yesterday I pulled out two varieties of apple from storage to taste, GoldRush and Pomo Sanel. It is one thing to find apples that keep for a long time without rotting, but that does not mean they will retain flavor or keep a good eating texture. Some apples will actually gain flavor with maturity, at least to a point, but most will lose flavor. These were picked later than they should have been. I suspect if picked earlier, they would store a little better. Gold Rush is well known for keeping very well, even without refrigeration. I have specimens from the refrigerator as well as from a cold room. All were picked late The apples from the fridge have retained some crunch, though they are not like the super crispy apples that you might find in a grocery store this time of year. Those apples are stored under controlled conditions with inert gasses to hold them in stasis until they are shipped to stores. The flavor has developed well in storage. When this apple is first picked it is edgy and harsh. I wouldn't say the flavor has improved from a month ago, but it is still complex and full with enough acidity to get my attention. The apples stored in the shed were wrinkled and drying out. None though showed any signs of decay. Their texture is rubbery, with no hint of mealiness. The flesh compresses, then starts to break into pieces. The flavor and sugar are concentrated and delicious. I could see storing a lot of these and drying the oldest left over fruits in the spring. They would be half dry already. All in all GoldRush is an excellent home orchard apple, and should be considered in any small collection of varieties. It combines long keeping, flavor, good cultural traits and some disease resistance. Out of all my dwarf interstem trees, it has the best, easiest to care for, form and high vigor. Pomo Sanel is a rare apple, barely known among a few fruit enthusiasts in this area, let alone anywhere else. Pomo Sanel was stored in the refrigerator. It gradually lost it's crispness. It is not meally or mushy, at least not yet, but all remnants of crispness are gone. I was hoping it would go rubbery instead, but it didn't. The flavor has changed, less complex, more appley, banana still prominent. There is some acidity, but the sprightliness is gone. I could eat plenty of these, but it is not equal to it's fridge mate at this point and will surely decline from here. Like GoldRush, it was probably harvested too late and might do better in storage if picked at an earlier stage, as soon as it reaches full size, but before the sugars develop. Pomo Sanel's most interesting attribute is it's late ripening in late December or usually January here. Given it's high quality straight off the tree at that season, it's a winner here in my climate. Whether it will store well enough beyond 4 weeks or so if harvested earlier and treated well remains to be seen, but keeping up with the likes of Pink Lady and GoldRush is a tall order and it no doubt won't. A really good storage apple can be very good, even excellent, but it's still not the same as a tree ripened apple kissed by frost and brought into it's prime in cold weather, nor is the whole eating experience the same. That paradigm is where Pomo Sanel and hopefully it's offspring will shine. I sent out many seeds this winter all around the world, so everyone cross your fingers and we'll check in about 8 or 10 years from now. I'm interested in breeding with both of these and have made some crosses. If I'm lucky, some of those seedling crosses might bear fruit this year. Posted on March 7, 2018 by Steven Edholm and filed under Apples, apple breeding, Fruit Review, orchard and tagged apples apple varieties heirloom apples heirloom apple varieties fruit apples that store well apples for storing apples (fruit) late apples late hanging aples late ripening apples tasting apples apple review (fruit) orchard apple trees gardening organic gardening food home orchard food preservation. Anyone that has followed my apple content for a while knows I'm obsessed with late hanging apples. In this video I'm tasting 9 late winter apples, mostly off the tree and a few out of storage. Results below. Some favorites, roughly in order. 1. Katherine. Named for early 20th century apple breeder Albert Etter's wife, this is an exceptional apple. It hangs very late and seems to be at it's best sometime in December. This late specimen has a rich multi-dimensional flavor. It was popular at new year dinner last night, one person described it as like wine. The flavor is not very describable, but it's deep and sophisticated. Earlier, it is often less complex and just pleasantly flavored. It has an unbeatable texture when it's at it's best, with a very light crisp flesh and plenty of juice. This would be in my top 10 apples as grown here. I have never stored it to speak of. 2. Whitwick Pippin: This beats out Katherine for intensity and any one person might easily prefer it to that apple. It is more intensely flavored, complex, quite sweet but also acidic. The texture at this time of year is better and I suspect it will prove to be a later hanger in the long run. I only scored Katherine higher because I am more compelled to eat it for whatever reasons and I would never argue with that. 3. Gold Rush: Even out of storage, this scores 3rd, although Lady Williams would likely go in this spot if it were ripe. These have held good texture and although they have picked up or developed some off flavors in the fridge, they are quite good, with a forward acidity, plenty of sugar and plenty going on in the flavor department. Thumbs up for a storage apple. 4: Pomo Sanel: Some specimens at this apple at this time will beat some specimens of Gold Rush, but today, gold rush won by a small margin. This is a very rare apple discovered locally. It bears some resemblance and eating characteristics to gold rush and it seems quite possible that it is from the same grimes' golden/golden delicious line that Gold rush is part of. Pomo Sanel is more rubbery in texture and will hold it's shape very well when cooked. I threw a slice in my coconut milk shrimp soup base the other day and let it boil for a while and it held up very well. I think you could probably get away with canning it for apple pie filling. 5. 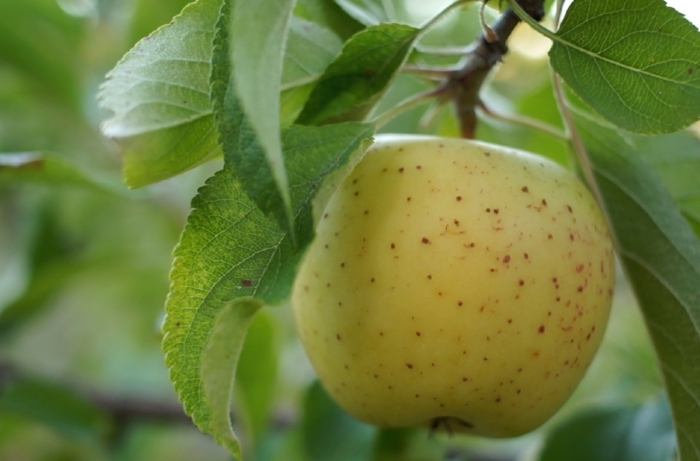 Hauer Pippin: I've not been able to get super excited about this apple, but it has some good characteristics. It is a rare apple outside of Northern and Central California. It was originally discovered in Central California and is rare outside of this state, though I hear it was grown commercially at one time. It is a very beautiful apple and hangs well to the tree through the first half of winter. The flavor is somewhat odd to me, but this specimen makes me think I should keep a branch of it. Lady Williams would be higher on this list if it were ripe now, but it is a couple weeks too early. It may even deserve to be before Hauer Pippin, even now. More apples could be on this list, those are just the ones I had to taste on this new years day. Here is a previous video on some of the same apples and others. Posted on January 2, 2018 by Steven Edholm and filed under Apples, apple breeding, Food Trees Fruits and Nuts, Fruit Review and tagged apples heirloom apples apple tasting apple review fruit apples (fruit) late apples late hanging apples winter apples storage apple apples that store well apples for storing orchard homesteading self reliance.